If you needed more confirmation that we live in hell, look no further than Tuesday’s Green New Deal vote in the Senate. Majority Leader Mitch McConnell introduced the first comprehensive climate legislation for a floor vote in the Senate in more than a decade. The move was as a cynical ploy to ensure climate policy continues to go nowhere. And go nowhere it did. Republicans voted as a bloc against the measure introduced by their leader while Democrats—with a few exceptions like Joe Manchin, Doug Jones, Kyrsten Sinema, and independent Angus King who voted “no”—voted “present” as a form of protest against taking part in a trumped up vote. The Green New Deal isn’t dead by any means, but Republicans’ vote on Tuesday have made it pretty clear they’re not going to seriously address climate change anytime soon. And with fossil fuel money pouring into Congress—the senators who voted against McConnell’s bill have taken $55 million in donations according to an Oil Change analysis—gridlock will continue as the timeframe to address the worst impacts of climate change continues to shrink. Republican climate denial has become so commonplace that it’s almost easy to ignore. So, too, has Democrats’ complete lack of ideas for how address it at the national level. The Green New Deal resolution, introduced in February by Senator Ed Markey and Representative Alexandria Ocasio-Cortez offers a series of policy goals to address climate change and inequality. Even though it never stood a chance of passing the Republican-controlled Senate, it’s shaken everyone from their reverie. Twelve Senate Democrats, including six presidential contenders in the Senate, have co-sponsored Markey’s version of the Green New Deal. A few Republicans have even put forward alternatives (more on that in a second). “The Green New Deal is not just a resolution, it is a revolution that has begun in our country,” Senator Ed Markey, who has introduced the original bill in the Senate, said at a press conference ahead of the vote. But amidst this revolution of imagining what was possible, rank and file conservatives dug their heels in, shrilly yelling about cheeseburgers and socialism and using cooked up numbers to fear monger. 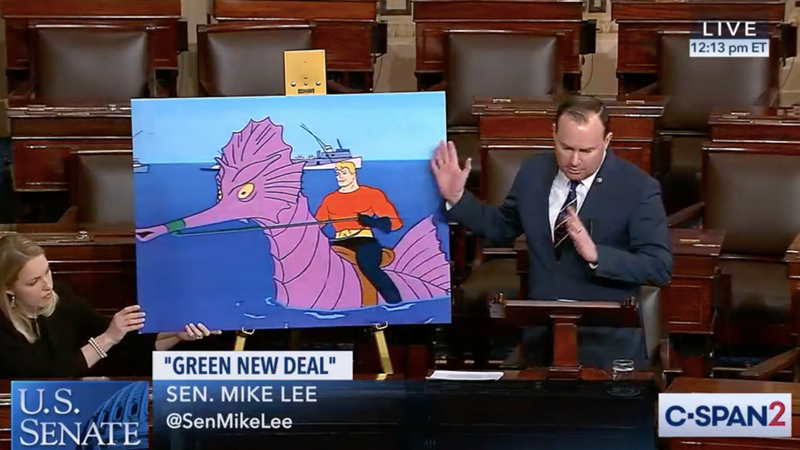 All that culminated with Senator Mike Lee basically shitposting in real life on the Senate floor by showing a picture of Ronald Reagan shooting a machine gun and riding a raptor holding an American flag, the perfect encapsulation of decades of Republican climate posturing. Then we had Tuesday’s vote. McConnell introduced a version of the Green New Deal that differed from Markey’s in one key respect. It was introduced as a binding resolution, a move that allowed McConnell to bypass holding hearings. That means no scientists saying that the Green New Deal’s goals are in line with the best available science or discussions of the economic toll of climate change, the falling cost of renewables, or any other helpful facts for setting climate policy will be on the Congressional record. Republicans, predictably, voted against the resolution en masse. By voting present, most Democrats made the case that they wouldn’t be part of the mockery of climate change (though it also opens them up to criticism they’re not serious about a climate policy idea that’s popular). What “something” looks like is really tough to envision at this point because the Republican climate policy cupboard is pretty bare. On Monday, Senator Lamar Alexander proposed a New Manhattan Project for Clean Energy, which doesn’t offer tons of specifics outside a five year timeframe during which the U.S. would double federal funding for energy research (including natural gas, a source of carbon pollution). It’s a nice idea that would’ve been hugely helpful a decade ago. Ditto for Representative Matt Gaetz’s Green Real Deal, a piece of legislation reportedly being crafted that hand waves at innovation and deregulation but sets no strong timeframe or goals to decarbonize the economy. Meanwhile, Democrats could still hold hearings on the Green New Deal in the House—where they control the agenda—and Markey’s non-binding resolution is still out there in the Senate. But Tuesday’s vote makes it clear it isn’t going anywhere anytime soon, and it’s unclear when or in what form Senate Democrats would take up the resolution again. “McConnell is playing games instead of rolling up his sleeves to work with members on both sides of the aisle on a solution,” Democratic Senator Ron Wyden said in a statement to Earther. While baldfaced climate denial may be more or less dead in the Republican party, today’s vote and discourse shows that there just isn’t much of an appetite for comprehensive climate policy from Republicans. Whether you read that as a failure of imagination, the fact that climate solutions don’t fit with Republican ideology, or a craven commitment to propping up the fossil fuel industry, it leads to the same basic outcome of spiraling carbon emissions. The climate doesn’t give a damn, though young voters certainly do. And if what we’ve seen over the past few months, they’re unlikely to forget Tuesday’s vote next November.